Gaza terrorists failed to frighten Israelis in southern Israel early Wednesday. A fizzled attack landed at least one rocket in Gaza. An early morning attack intended for southern Israel following President Shimon Peres’s birthday bash fizzled with at least one – and possibly two -- of the rockets intended to kill Jewish civilians exploding instead inside Gaza. 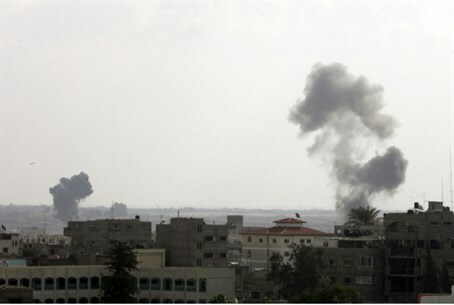 A total of three rockets were fired overnight, security officials said. The third rocket reportedly landed on the Israeli side of the border in an open area, but no property damage was reported, and no one was physically injured, according to Israel state radio. The missiles were apparently aimed at the Ashkelon coastal region, according to the projected trajectory calculated by IDF military equipment. The Color Red incoming rocket alert siren was activated in the Mediterranean coastal city of Ashkelon and surrounds in response to the attack, an IDF spokesperson confirmed. Late Tuesday night, one rocket was launched by Gaza terrorists and actually succeeded in reaching an open area in the Ashkelon coastal region, but there were no reports of any physical injuries or damage to property. As on Wednesday, the Color Red air raid warning siren activated, sending residents to take cover in safe spaces around the city and surrounding area. In other defense news, Palestinian Authority Arabs clashed with Israeli army forces in Samaria (Shomron), east of the PA Arab city of Kalkilya on Wednesday morning. IDF troops came under heavy attack by rioting Arabs who hurled rocks and other items at the soldiers. The troops responded with riot dispersal methods.